Our IT Governance Service provides an independent resource for executive leadership teams to define and evaluate the current state and future state of the business with measured execution. Put simply, we’ll look at where you are now, compare it to where you want your business to be and provide you with recommendations along the way to help you achieve major milestones. Advisory Services provide a full framework to achieve strategic vision and keep it relevant as your business environment evolves. Supplement your team with the expertise it needs to achieve the immediate goal, while growing the skills and capability internally that mature the organization. Gone are the days when IT could operate in a silo without communicating with the business to achieve goals. As technology continues to evolve and markets adjust to these technology advancements, utilizing the IT organization to stay ahead of the competition is vital to success. But how can business leaders ensure that IT is equipped with the tools and resources it needs to respond to this changing landscape? How can IT leaders ensure they are on the right track to keep up with growing expectations? Leadership and governance are the most important aspects of making an IT organization work just as much as the strategy is. Charting the course of IT transformation is an intricate process that involves many different layers depending on the unique needs and goals of the business. Creating a business-aligned IT roadmap to map projects to is the first part of the roadmap advisory. Executing on that strategy requires much more detail. BestIT utilizes a triadic methodology to help your business move through each evolutionary stage. Once you have a unified IT roadmap in place, we will assess and map the related activities included in the strategy that tie back to the business goals. This stage of the process provides a structure for your business and BestIT to form a collaboratative forum where questions, new ideas, and business needs can be discussed, with the ultimate goal of continuously increasing the value and return on your technology investments. Through this stage of the process we will determine the aggregrated level of business pain, the strategic/competitive advantage and the associated business benefits of the projects and initiaves outlined in the IT roadmap. Once all areas of the IT roadmap have been discussies and projects laid out, it’s at this point that prorities need to be made. Which projects will have the most impact to the IT roadmap? Based on current resources, how long will it take to complete these projects? How much effort will be necessary to complete the prioritzed projects included in the IT strategy? 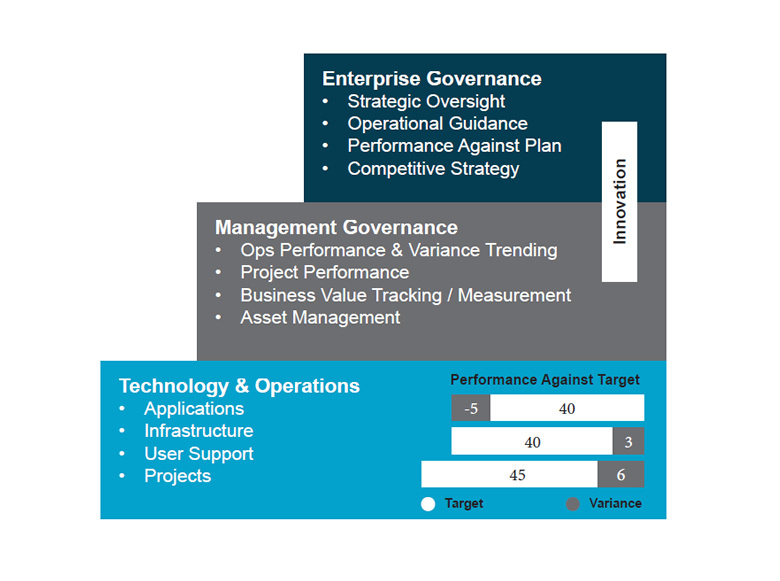 BestIT references essential elements of governance, IT service management, process and performance measurement frameworks to enable predictability. An action plan will be jointly developed that outlines the major tasks that must be accomplished, set delivery milestones, identify risks/issues, and define the expected results. At defined points over the set calendar, progress will be measured against the plan and expected results. BestIT will provide best practices that enable your business to track value earned via delivery, measure benefits captured as a result of milestones reached, and identify the degree of variance from the plan. These checkpoints will be an opportunity to discuss the challenges the delivery team is facing, address issues that have arisen, and initiate mitigation strategies where necessary to limit the continued impact of variance. You need the right amount of technology and innovation to make sure your people work as efficiently as possible. That’s why we offer dynamic and responsive IT solutions designed to help your business grow and be flexible, without massive capital investments.